Sports are not just for the young, but for the young at heart as well. Plumas County is home to many seniors who have chosen the Sierra as the backdrop for their golden years. With fresh air and clean water, Plumas County is the ideal location for a long and healthy life. Offerings for senior fitness in our area are varied with a fat handful of skilled instructors available for encouragement and guidance. I once overheard a comment on the abundance of happy, healthy-looking gray-haired folk in Quincy. Maybe there is something in the water, or perhaps, the beauty is assisted by the lure of another day living in the beautiful Sierra. Yoga is one of the “senior-friendly” exercise forms that can enhance flexibility and strength. It is also easily modified to accommodate people beginning at any level of fitness. Darlene Gutierrez started teaching Gentle Fit at Quincy Yoga and Wellness Center in 2015 when she became a certified teacher. She has actually been interested in fitness for over 20 years, both in the gym and at home. The turn of the page occurred nine years ago when, while assisting her husband recover from a debilitating stroke, she became focused on rehabilitative and quality of life fitness. “I started going to the class to help my husband with his rehabilitation,” said Gutierrez. 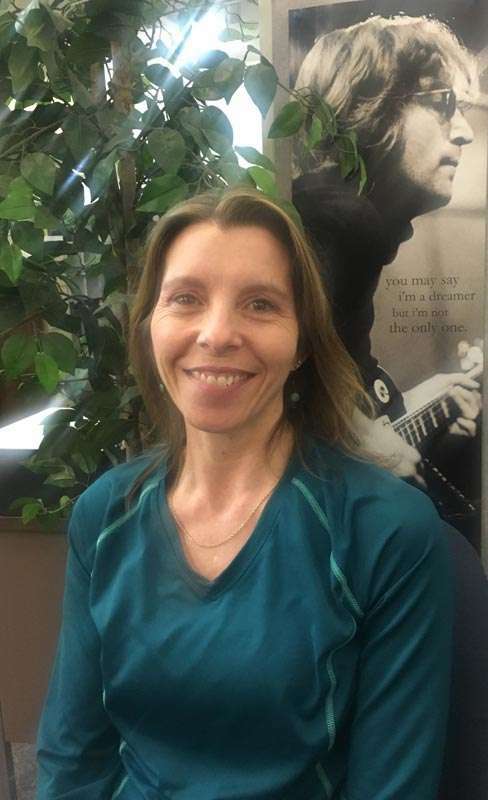 “Attending the Gentle Fit class at QYWC was one piece of my journey in fitness and, when the instructor moved from Quincy, I began instructing the class in 2014. As Gutierrez witnessed the benefits of senior health, she was motivated to pursue a certification as a Silver Sneaker Flex Instructor in 2018. “I saw the value of the course and seeing people get well inspired me to want to help,” said Gutierrez. Gutierrez teaches a gentle fitness class emphasizing strength, flexibility, balance and injury prevention. The class is open to any age and is a chair-assisted class that is targeted for those over 65. The exercise program utilizes hand weights, resistance bands and other light equipment provided during the class. Gutierrez says that she enjoys assisting others with improving their flexibility, strength, coordination and balance in order to help them maintain a high quality of life by being fit for daily activities. Adding to the long list of certifications, Gutierrez became certified specifically as a senior fitness instructor through the American Senior Fitness Association in January 2016. “A student pointed me toward the Silver Sneakers Fitness Program,” Gutierrez. “I went through the certification process because it would allow the removal of the financial barrier some seniors face to attend class.” Many insurance companies covered the program when Gutierrez first learned of it. Things have since changed. “Sadly, insurance coverage changed in January 2019.” Fewer common insurance carriers partner with the program in California. United Health and Anthem Blue Cross no longer cover the program. Eligibility for Silver Sneakers is found at SilverSneakers.com. “United Health now has their own version of a senior fitness program and I am working with them to become a certified instructor,” said Gutierrez. But for those who have insurance that still covers the program, it is handy to know that Feather River Fitness is a Silver Sneaker Facility, which means anyone who is a Silver Sneaker member has free membership at FRFC as a benefit. People have stuck with the classes even though insurance has stopped covering the cost. The classes cost a few bucks and it is difficult to put a price on living life in good health. After discovering that she had a passion for helping people get and stay fit to enjoy life to the fullest, Gutierrez decided to expand her education and received her certification as a personal trainer through the National Academy of Sports Medicine in May 2016. The classes offered are co-ed with both men and women using the instruction to increase flexibility and stay limber. Quincy local outdoor enthusiast Judy Buck says she loves the classes and thinks they are a terrific asset for the community. These are but a few of the many opportunities for seniors to stay fit locally. “There are plenty of benefits to staying active as we age,” said Gutierrez. “We have bowling, golf, swimming and hiking,” which are all great activities. We have a disc golf course on Mount Hough and another course at Pioneer Park in Quincy maintained by Plumas Park and Recreation District. The district has a Pickle Ball court, and there is always time-honored tennis with courts around the county boasting the best of scenic views. At Quincy Yoga and Wellness Center, David Schaffer teaches tai chi/qigong Thursdays at 5:30 p.m. and Jane Steidel offers a gentle yoga class on Fridays at noon. On Tuesdays at 9:30 a.m., Laura Walmer teaches Zumba Gold, a low impact dance exercise at the same location. Averil Kimble teaches the class in the summer months. There are a variety of yoga styles presented at QYWC that many seniors may find helpful and invigorating. Brenda Morgan teaches yoga class at the Feather River Fitness Center on Tuesdays and Thursdays at 8:20 a.m. There are dozens of similar classes around the county. Anyone aware of classes is asked to send info to [email protected] and a comprehensive list will be compiled and published in the sports section.